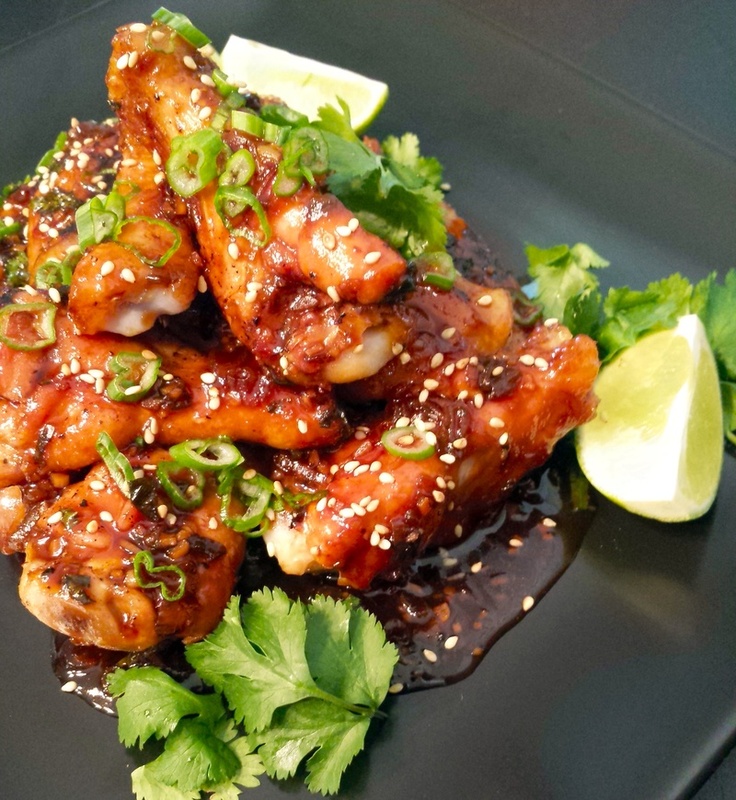 These Asian Kickin' Chicken Wings are a spicy, sweet, tangy and delicious appetizer that would be perfect for Superbowl! The sauce is made with soy sauce, sesame oil, ginger, garlic, scallion, lime and other aromatic Asian flavors that will have you coming back for more. Pre-heat your oven to 350 degrees. In a large casserole dish, drizzle 2 tablespoons of olive oil. Place wings on top of oil an season with salt and pepper. Cook on the middle rack of your oven for 30 minutes. In the meantime, heat a meidum saute pan over medium heat. Add sesame oil to pan and heat for 1 minute. Add ginger, garlic and scallion whites to pan. Stir with a wooden spoon for about 30 seconds until fragrant. Add sauce sauce, honey, Sriracha and chopped cilantro to pan, turn up the heat to high and bring to a boil. Boil mixture for one minute then add corn starch slurry. This slurry-mixture will thicken up the sauce very quickly. Once the sauce has thickened turn off the heat and reserve sauce. Pull your chicken wings from the oven once they are done, and drizzle with half of the soy sauce mixture. Return the chicken wings back to the oven for another 25-30 minutes so they can caramelize. Once they are done, remove wings from oven and place onto serving plate. When ready to serve, drizzle the remaining half of the soy sauce mixture over the wings and garnish with sesame seeds, scallion greens and cilantro. Don't forget to squeeze a little fresh lime over them when fisnished, amazing!